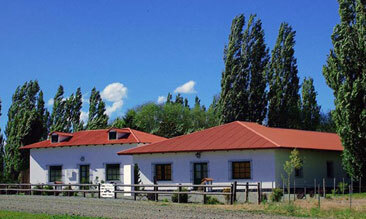 Leleque Museum: to the rescue of Patagonian history - Esquel, Patagonia, Argentina. The setting of this museum, aside from its careful collection, is one of its most striking features. It is not in the middle of a town or city, but sets in a landscape whose history you want to witness, almost in the same environment seen by the Indians centuries ago. In the steppe, 100 m from the paths of La Trochita at the foot of the Andes, there is the Historical Museum of Leleque. Scientists and researchers from across the Patagonia attended at the opening of this museum, back in 1998. To do so, they had to move from Esquel (the nearest town) to farmhouse Benetton, property which is within the institution. In fact, to carry the museum out, there were contributions of the Benetton Group SA, in addition to the Compañía de Tierras de Sud Argentino SA and Fundación Ameghino. The museum has 4 rooms. The first is dedicated to the indigenous people, where you can observe the reproduction of a wigwam, everyday objects and explanations of procedures used. The second room explores the first contacts between Native Americans and whites cultures. The third room develops the state's presence in Patagonia, the incorporation of the capitalist system and the disputes over land control. The last room pilgrims the social transformations occurring in Patagonian society due to the arrival of immigrant groups from different ethnic groups. Chilean, Lebanese, Italian, Spanish, Welsh and American, each with different habits and costums forged an identity for this country during the first half of the twentieth century. In annex building, the museum also has "El Boliche" that reproduces the atmosphere of a general store at the beginning of the century. To reach the museum ypu have to take the National Route 40. If you starts from El Bolsón, you must dirigrise south. And if done from Esquel, you must go to the north. It should be taken a dirt road to the east at km 1440. Distamce to Esquel: 90 km. Distance to El Bolsón: 80 km. Hours: 11 to 17 hours. Closed Wednesday. The museum is closed during the months of May and June. La Trochita: a very unique train 1An historic express that daily makes its way over a landscape of dreams. It awakens the fascination of the fans because it preserves the original locomotives and wagons. Futaleufú dam and river Futaleufu dam is an important structure built during the seventies, whose function is to generate power to meet Aluar's demand on the coast of Chubut. A trip to Chile from Esquel The San Rafael Glacier, located in the homonymous lake in Chile, provides an excellent excuse for a unique tour visiting the mountain forests near Esquel, the beautiful Valdiviana forest in Chile and return through the north of Santa Cruz. From Esquel: Lago Puelo National Park Less than 200 kilometers from Esquel, traveling a nice path between foothills hills, one reaches the Lago Puelo National Park, which offers beautiful sceneries and countless activities. Esquel hosts cycling competetitions Esquel is one of the host cities of national cycling championships. Fishing in Esquel: Futaleufu River basin In the Esquel region most rivers drain into the Pacific allowing fishing of species that are commonly found in Chilean rivers. More than 100 years since the referendum A fact that few people in this country are aware of is that in 1902 Trevelín Welsh settlers chose to be Argentine and not Chilean, certainly influencing the final decision of the arbitration award on these lands. Colony Lago Rosario Told by its protagonists, the moving story of the inhabitants of the Colony Lago Rosario has been published in the book "Memorias de Humo". Summer in Esquel Horseback riding, rafting, bird watching, visits to Ice Tunnels and to the Los Alerces National Park are some things you can do during the summer in Esquel.